When Oliver Twist meets Fagin for the first time he … (Dickens, fig. 1, 100). Fig. 1. 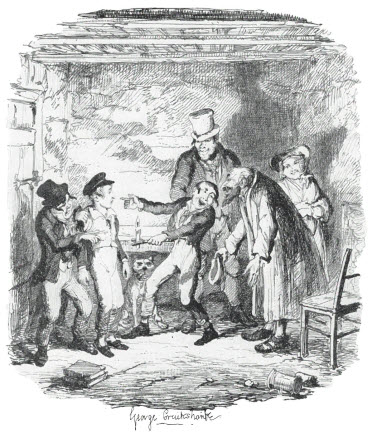 Oliver's reception by Fagin and the boys from Dickens, Charles. Oliver Twist. Edited by Kathleen Tillotson. Oxford: Clarendon Press, 1966, p. 100. Author. Title. Place: Publisher, Year. Medium. Dickens, Charles. Oliver Twist. Edited by Kathleen Tillotson. Clarendon Press, 1966. When you are citing an image reproduced in a book or periodical, it is usually sufficient to refer to it in your text and create a Works Cited entry for the book or journal article in which the image appears. If a page number appears include it. Illustrations appear directly embedded in the document, except in the case of manuscripts that are being prepared for publication. Each illustration must include a label, a number, a caption and/or source information.